This morning on the way to work I heard an interesting discussion on NPR. The talk was titled End Of Days For Bookstores? Not If They Can Help It. Most of the talk centered on the idea that bookstores will need to sell more than just books if they want to keep up with online sales. Some bookstores are thinking of carrying products that have e-reader capabilities; like iphones, and the like. The thought is to cater to the diverse reader market, and not to worry about how readers read. What really struck me was when the topic turned to other reasons book sales are declining; former top selling genres are disappearing. Travel guides and reference books are disappearing as most of this kind of information can now be found on the internet. It made me stop and think about things that are disappearing, either due to the internet or our smart phones. Just the other day I went looking for a magnetic shopping list notepad. Remember the notepad on the refrigerator where we could conveniently note things we are out of? They are now very hard to find. When I asked about this at the third stationary store I visited I was told most people now note this type of list on their smart phone. I do not have a smart phone (mine is dimwitted at best) but I do have an ipod, and yes, there is an app for that! Telephone books put out by the phone company are not dead, but many people are no longer advertising in the yellow page section; it is far too easy to use Google Places. Same with newspaper ads, if you are one of the millions of people looking for a job you know the last place to look is in your local newspaper. On the other hand because there is so much information available to us and many use the internet for educational purposes, science is a growing genre. Often science books now hold top honors on best seller lists. I am sure booksellers are happy to know as some genres disappear others take hold. Now if only they would sell shopping list notepads. Are there any products or services you notice are disappearing only to be replaced in new settings? Let’s talk about it. What an interesting post Sari. It really is sad about the effects ti book stores with all the reading options now available. Thanks Diane, hopefully many bookstores both large and small will survive our rescission and online stores. It will be interesting to see what happens with the new Google store. E-books might gain in popularity since books bought from Google can be downloaded into any e-reader. 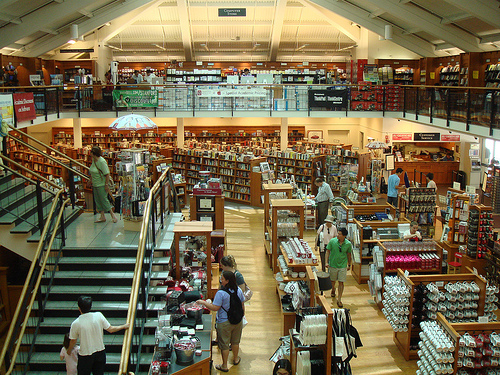 Book stores are wise to look into selling e-readers.